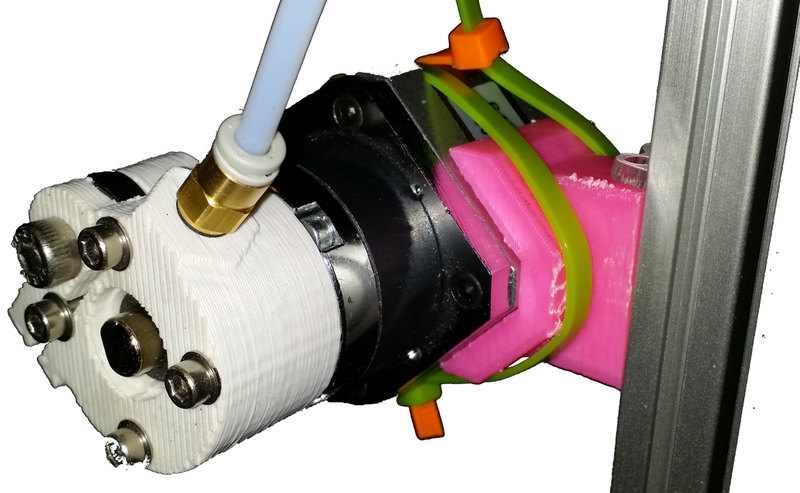 Installed new Bowden extruder motor mount to vertical frame leg. Bracket has very tight tolerance to the NEMA17 motor body, so that the motor almost snaps into the mount. 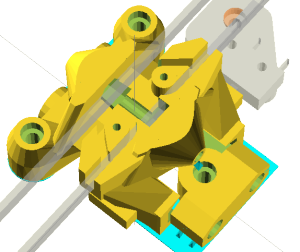 The attachment is actually very solid, even though it is made by wrapping some cable ties around the motor in an “X” pattern. It mounts to the 15mm wide extrusion rail with two 8mm M3 hex-head bolts, and two standard M3 nuts in the rail. 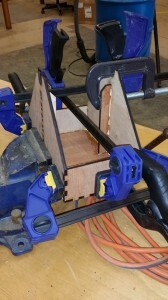 Clearance from rail is enough to allow linear slider wheels to pass by. Drawing is available from my github area. 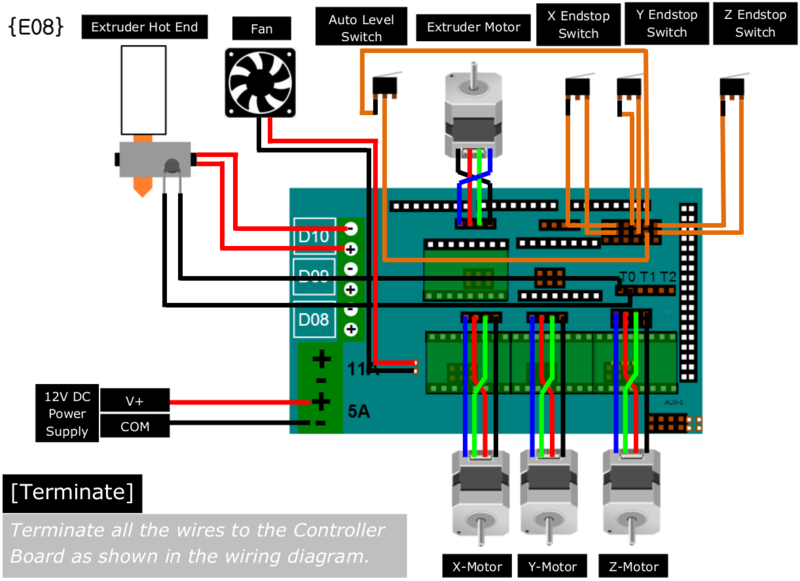 This is the diagram for wiring the stepper motors to a RAMPS shield. I am a bit confused. I thought that each pair of leads (left to right pairs) on the groups of four were leads to a single winding. Why would they want to swap leads (chaining windings together?) on the main drive motors? Note that all of these driver boards have all three jumpers installed. AFAIK, this setting just made steps smaller. 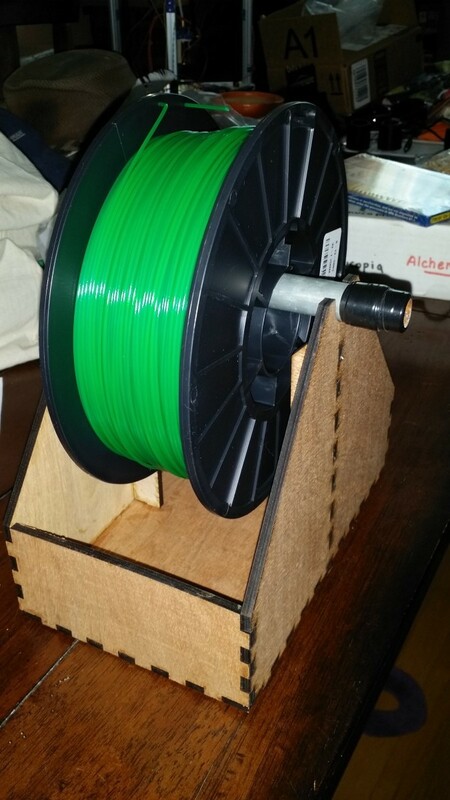 Also, why swap outside leads on the extruder motor? Leads on the RAMPS board are labeled (in order), 2B 2A 1A 1B. I was thinking that 1 and 2 refer to windings, and A and B refer to which side of the winding. My NEMA17 motors have Blue, Yellow, Green, Red wires (in that order). How might that correspond to the Blue, Green, Red, Black wires shown for these motors? Is it possible that the flipping is only needed for their brand of motor, and not for mine? If their brand of motor is different from mine, could the swapping be necessary to put the leads for each winding on the appropriate pins, whereas for my brand the swap is unnecessary? Their drawing might make sense if the motor did not put leads for the same winding next to each other. On my motors, the Blue and Yellow leads show 2.7 Ohms, and the Red and Green leads show 2.7 Ohms, so those look like winding pairs. (Blue or Yellow) to (Red or Green) show no connection. My best guess is that I don’t need any “wire flipping” for these motors to a RAMPS board. If the direction is wrong, I can just flip the plugs over, right?